Why would I have to lie about it, you idiot? Sit. And to think I was being considerate about letting you go alone! Sit! You could at least tell me what you talked about! Sit! I was just worried you'd do something stupid, but you're so stubborn! Sit!! How could Kagura find the same clothes for Hakudoshi three times in a row? "You understand now, you two-timing dog?" …Shippo holding onto Inuyasha's hair to prevent it from flying into his face? KAG: A swarm of stampeding demon rats! Just what does Naraku hope to achieve by doing this? The one controlling the rats, Kohaku, finally makes a decision after all his suffering! 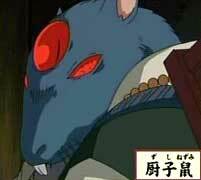 Just to lure Kikyo out... do you know how many villagers have been destroyed?! If you meet that person, tell her... as long as she runs away from Naraku, the same thing will keep happening. Kohaku! You'll be devoured by the rats! I'm sorry, Sister... But I have to obey orders! Next on Inuyasha, "Kohaku's Resolution and Sango's Heart". I can't drag this any longer... I have to defeat Naraku!